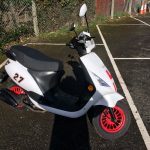 Our 125cc’s. 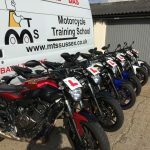 MTS Sussex run Yamaha YBR’s. 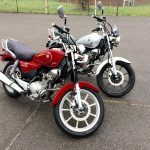 They’re just mini versions of a big bike; easy to ride, solid & reliable, perfect for New Riders, CBT's and A1 motorcycle lessons. Again, we have red, black, silver...you may laugh but many a student has chosen a bike because of the colour - and nope it isn't the ladies! The custom bikes are always popular so if you need or want a low ride, please mention it at the time you book as the 'lows' are in 'high' demand! We also have Suzuki GS500'S for those who prefer the retro styling. Something for everyone, especially as we have a selection of 'lowered bikes' (MT-07's & GS500) making DAS & A2 possible for almost anyone! Our lowered seat Yamaha MT-07's are really popular at MTS reaching the floor is easy, even if you're already pretty low to it normally! Not to put too finer point on it - but here's Tom, one of our students having no problem getting his leg over! 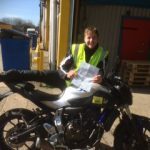 Luckily for us at Motorcycle Training School Sussex, having a mechanic on site means all the motorbikes are well maintained and regularly serviced, and if any adjustments need to be made for your comfort, we can usually accommodate this quite easily, so don’t be afraid to ask when it comes to maybe needing a lever moved slightly or the suspension lowered a bit… after all, with MTS Sussex, this is all about you!